With the blizzard whirling down Brick Lane this week, it was the ideal moment for a hot curry to warm the spirits, and so – dodging the mischievous curry touts’ snowball bouts between rival restaurants – I set out in the company of Spitalfields Life contributing photographer Jeremy Freedman, to make the acquaintance of some of Brick Lane’s most celebrated Curry Chefs. We were privileged to be granted admission to the modest kitchens tucked away at the back or in the basement of the curry houses, where Head Chefs martial whole teams of underchefs in a highly formalised hierarchy of responsibility. It was a relief to step from the cold street into the heat of the kitchens, where we discovered our excited subjects glistening with perspiration, all engaged in the midst of the collective drama that results in curry. We found that these were men who – for the most part – had worked their way up over many years from humble kitchen porters to enjoy their heroic leading roles, granting them the right to a degree of swagger in front of the lense. We encountered the charismatic Zulen Ahmed (pictured above) standing over his clay-lined tandoori oven beneath the Saffron restaurant where he has been Head Chef for ten years now. 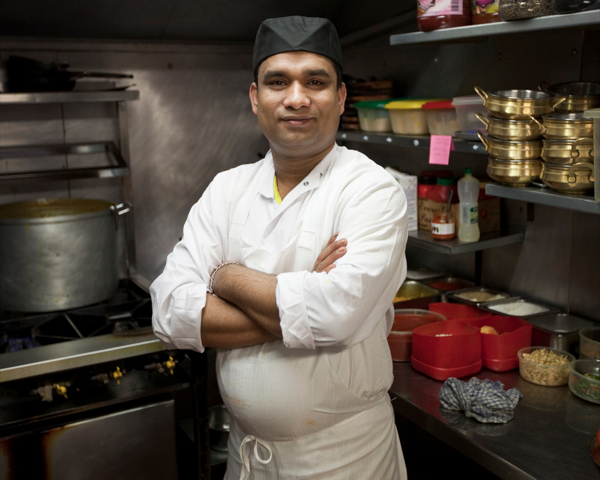 Trained by the renowned Curry Chef, Ashik Miah, Zulen served eight years as a porter before ascending to run his own kitchen, now supervising a team consisting of two chefs who do the spicing and make the sauces, a tandoori chef, two cooks who cook rice and poppadums, a second chef who prepares side dishes and a porter who does the washing up. “The Head Chef listens to everybody,” he explained deferentially, with his staff standing around within earshot, and thereby revealing himself to be a natural leader. Across the road at Masala, we met Head Chef, Shaiz Uddin, whose mother is a chef in Bangladesh. She taught him to cook when he was ten years old. Shaiz told me he worked in her kitchen as Curry Chef for seven years, before he came to London ten years ago to bring the authentic style to Brick Lane, where today he is known for his constant invention in contriving new dishes for his eager customers. It was quickly apparent that there is a daily routine common to all the curry kitchens of Brick Lane. At eleven each morning, the chefs come in and work until three to prepare the sauces and half cook the meat for the evening. At three they take a break until six, while the underchefs, who arrive at three, prepare the vegetables and salad. Then at six, when the chefs return, the rice is cooked and – now the kitchen is full – everyone works as a team until midnight, when it is time to throw out the leftovers and make the orders for the next day. This is the pattern that rules the lives of all involved. “I like to be busy,” Nurul Alam, Head Chef at Preem & Prithi, informed me blithely – he regularly cooks three hundred curries a night. 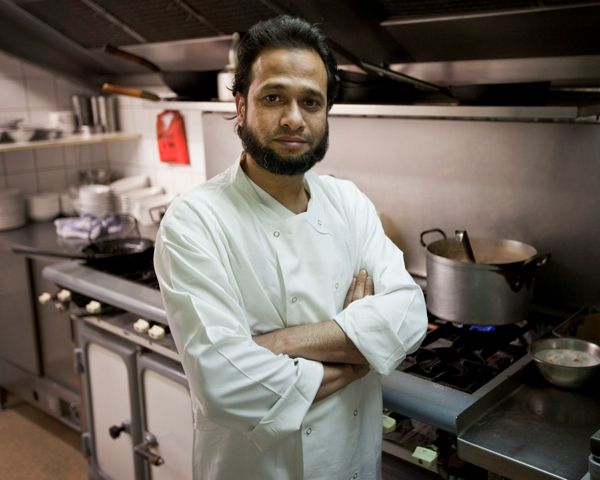 Over at the Shampan, Monzur Hussain, emerged from the kitchen with his brow covered in perspiration to brag about his meteoric rise, commencing as a kitchen porter in 1997, becoming a chef in 2000 and winning Best Chef in the Brick Lane Curry Festival in 2005. Monzur sets an example that is an inspiration to Dayem Ahmed, a porter who has been there just six months, already daydreaming of achieving Best Curry Chef in 2018. Finally, at the Aladin we met Brick Lane’s most senior Curry Chef, the distinguished Rana Miah who started work in 1980 as a kitchen porter when he arrived from Bangladesh, graduating to chef in 1988. “At that time we served only Bengalis, but by 1995 the customers were all Europeans,” he recalled, describing his tenure as chef at one of Brick Lane’s oldest curry houses, which opened in 1985 and is second only to the Clifton in age. Rana explained that he runs his kitchen upon the system of “Handy Cooking,” based around the use of large stock pots to cook the food. “That’s the way it’s done in Bangladesh,” he confirmed, “This is a traditional restaurant.” As the longest serving Curry Chef, Rana gets frequent consultations from the other chefs on Brick Lane and, remains passionate about his vocation, arriving before everyone each day and leaving after everyone else too. 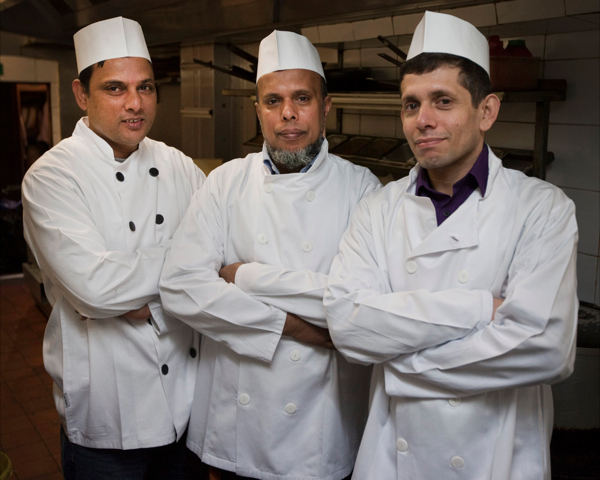 We never asked the Curry Chefs to cross their arms, but they all assumed this stance, independently and without prompting – even Dayem, the kitchen porter, yet to commence his training as a chef, knew what to do. It is a posture that proposes professionalism, dignity and self-respect, yet it also indicates a certain shared reticence, a reserved nature that prefers to let the culinary creations speak for themselves. So I ask you to spare a thought for these proud Curry Chefs, working away like those engineers slaving below deck on the great steam ships of old, they are the unseen and unsung heroes of Brick Lane’s Curry Mile. 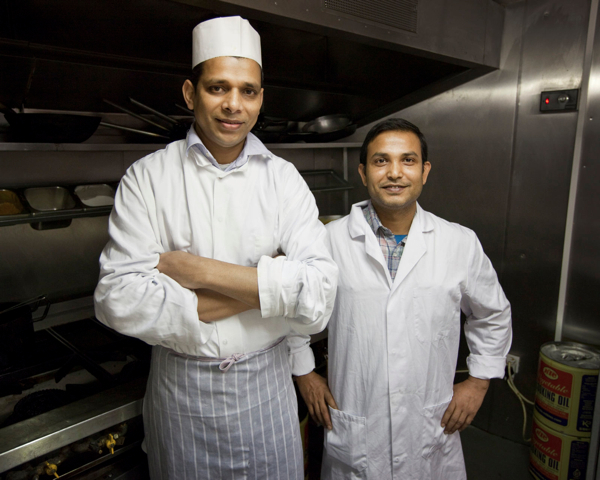 Head Chef Shaiz Uddin with his colleague Monul Uddin, Tandoori Chef at Masala, 88 Brick Lane. 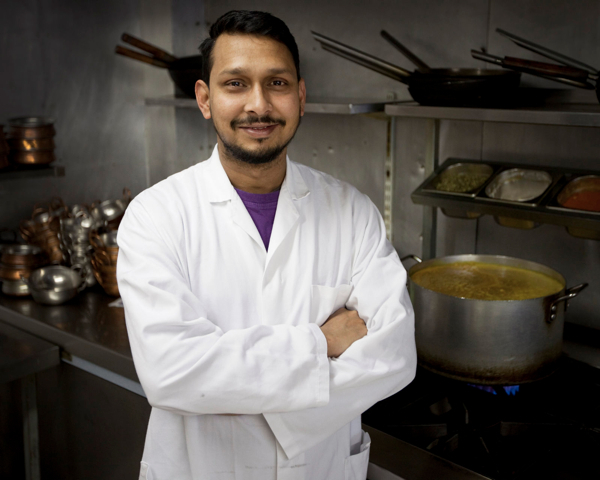 Nurul Alam, Head Chef at Preem & Prithi, 124/6 Brick Lane, cooks three hundred curries a night. Rana Miah, Brick Lane’s longest serving Curry Chef stands centre, flanked by Kholilur Rahman and Mizanur Khan in the kitchen of the Aladin, 132 Brick Lane. 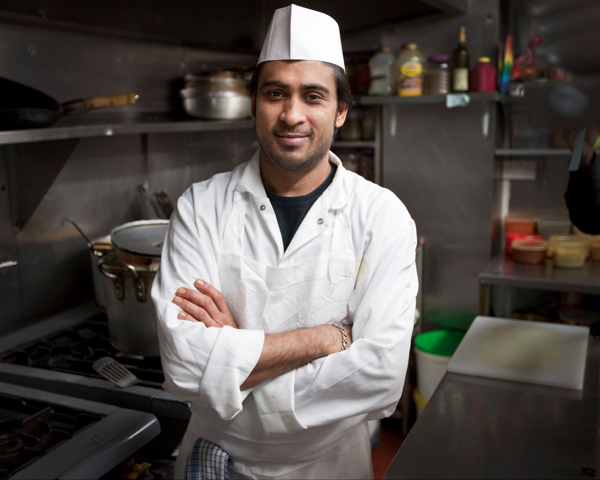 Monzur Hussain, Head Chef at Shampan, 78 Brick Lane. Dayem Ahmed, kitchen porter of six months standing and aspiring chef, at Shampan. You and Jeremy have done it again! Great storey and BEAUTIFUL photographs. These men are captured with such humility and calm within their kitchens. What a great insight into this hidden world. Im heading to Brick Lane tonight! Now I must decide what restaurant to go to. Warm hugs from southern Brazil! oohhhh their faces indeed. how beautiful. next time you see mr. d. ahmed (or any or all of these folks) tell him we’re rooting for him here in america. i am the son of zulen ahmed. My life’s ambition has been to visit India but at the age of 71 my time is running out! I compensate by cooking Indian dishes & curry is my most favourite dish. Here in rural France it is difficult to find all the spices but I have bought a Masala Dhabba to keep those I have fresh. I am now going to treat myself to a London break so that I can treat myself to a curry in Brick Lane – or maybe two, or three or …………….! It is tragic to hear that the leftovers are thrown out when there are so many people living rough on the streets of London – can’t something be done to distribute this wonderful food. I was salivating at the thought of one of these wonderful curries: such a shame I live in North Norfolk! Would it be possible to see a picture of No. 36 Brick Lane, please? My HART family started their furniture factory there in the 1870s and stayed there for several generations. The Salvation Army’s General Booth had his first public meeting there too. I visited when I was a small girl, about 7 years old in 1934. It smelt beautifully of the wood they used to make their furniture, and I have been fascinated by wood and timber ever since. My great-grandfather committed suicide there in 1881 by hanging himself. I live in Canada now. article. If merely there was considerably more weblogs just like this amazing one on the internet.